When is a stent necessary? Are there alternatives to stents? Though stents, if the best course of treatment, are usually placed at the time of the initial catheterization, on some occasions, there may be a choice in which case the interventional cardiologist will discuss options with you, your family and your doctor before acting. If medical therapy is a viable option, you can always come back later for a stent if medication is not adequate to control your symptoms. If surgery is the best choice, a cardiac surgeon will be consulted for discussion who will then meet with the patient and his or her family for discussion. Surgery will not be done on the day of catheterization. What types of stents are there? 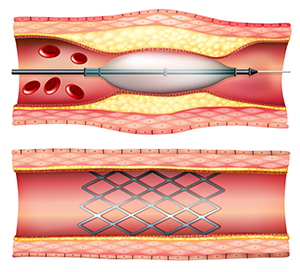 Drug-eluting stents – When stents are implanted, they immediately eliminate the blockage and restore normal blood flow to the portion of the heart that the artery supplies. They can be used for someone in the midst of a heart attack or implanted electively in patients that simply have chest pain while exercising. To eliminate recurrent blockages later at the treated site, stents are “drug-coated” with a material that prevents scarring which in the past has resulted in blockages recurring in the original site. These stents have become so effective that they have all but replaced the original bare metal stents. Drug eluting stents require both aspirin (81 mg only) and a second special kind of blood thinner called antiplatelet therapy known as Plavix (clopidogrel), Brillinta (ticagrelor) or Effient (Prasugrel). These additional drugs should be taken without interruption for at least 6 months or in the case of a heart attack 1 year. Bare metal stents – These are the original stents. They are very effective in opening up heart arteries. The disadvantage of these stents is that a blockage can recur at the site of the stent in 1 out of 6 patients requiring a repeat procedure. They are only used when patients can only be on added blood thinner for 1 month or less. A study of the arteries, called a diagnostic cardiac catheterization, is performed to determine if there are blockages in the vessels.